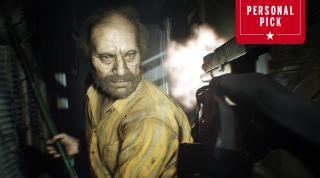 Survival horror wasn't reinvented in 2017, but Capcom's seventh game left it in better shape. I'd lost faith in Resident Evil. Everything after Resident Evil 4, Shinji Mikami's bold reinvention, was a disappointment. I was sure that game would herald a new golden age for the series, but then I played Resident Evil 6. So I was delighted to discover that the seventh main entry is a return to form, inspired by the first trilogy of games. It focuses on slow, creeping horror, a thick atmosphere, arcane puzzles, and self-preservation over melodrama and dumb slow-motion action. And that's why it's the best Resident Evil in years, even if it's not quite the dramatic change in direction the shift to first-person suggested it might be. The first hour, however, is very different, more in line with contemporary horror games like Amnesia and Alien: Isolation. It's a perfectly paced, terrifying introduction to the dilapidated Baker household, whittling away at your nerves, never pushing things too far. But when you start finding weapons and green herbs, and puzzles start getting in your way, it's like playing one of the PlayStation-era games again: albeit with vastly better visuals and a new, more intimate perspective. The Baker house is a disgusting, eerie, and oppressive space, reminiscent of the original game's Spencer mansion, if not quite as opulent. There are no marble statues or lavish rugs here: just creaky, dust-covered floorboards and fridges stuffed with rotting meat. It's one of the grimiest games on PC, and you can almost smell the stench as you creep through its dimly-lit corridors and damp underground passages. And when Baker family patriarch Jack shows up, things get really scary—more so than the regular enemies, which are an admittedly uninspiring collection of slimy blobs. But what I really love about Resident Evil 7 is how lean it is. It takes a series that had become hopelessly bogged down in absurd mythology and outdated ideas and confidently hits the refresh button. There's still the odd tedious boss battle, but for the most part it feels like a new, almost standalone game. It's a reboot done right, retaining the spirit of the source material but making it feel fresh by ruthlessly excising the bits that don't work. And the subtle connections to the other games in the series are more special as a result of Capcom distancing itself from its own legacy. There are a few things wrong with Resident Evil 7. It loses its way in the final act, for instance, giving you too much ammo and throwing too many identical slime monsters at you. But overall, I love it, and I'm glad Capcom took a chance on something so different. The days of Leon S. Kennedy back-flipping over zombies and Wesker dodging bullets like a character in The Matrix are, hopefully, over. I'm eager to see where Resident Evil goes next, and whether it'll continue to shake up the formula. And I love the idea, based on clues in the ending, that this is set in another timeline. There's a lot of backstory I think it's best Capcom just writes off.